We had this brand new Skoda Kodiaq into us for Gtechniq’s Crystal Serum Ultra and two coats of ExoV4 (CSU Black) and C5 Wheel Armour on the entire wheel surface. The Kodiaq was delivered to us right after it cleared importation and so still had all the protective film covering the upper areas of the car and had not yet been washed by anyone else. E Tarrant & Sons Ltd Couldn’t of been more helpful. They organised the delivery and collection of the Kodiaq and adhered to all of the customers requests including for the transportation film to be untouched. Before removing the film we gave the car foam pre clean using Gtechniq’s W4 Citrus Foam to loosen the dirt and bird droppings that was very evident on the film. Once the initial pre-clean was performed we began our standard New Car Protection Detail. Once we safely removed all of the protective film we rinsed the entire vehicle down using CleanerCar’s Pre Clean and began our wash and decontamination routine. 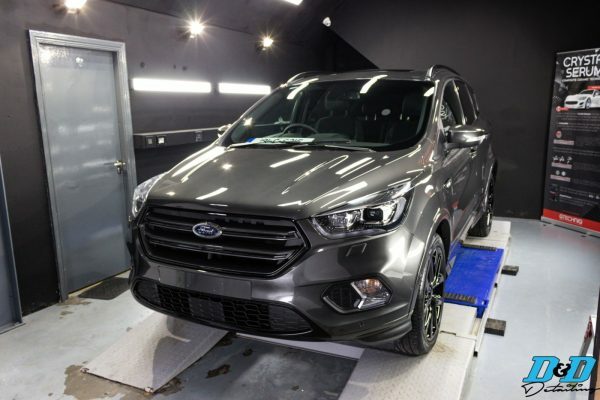 Once the Kodiaq was decontaminated it was brought into our booth for inspection and to begin the polishing procedure. The paint was in extremely good condition due to no one else washing the vehicle prior to coming to us. There was very little swirls to remove but there was some embedded bugs that had to be removed and one or two holograms. Once the paintwork was jewelled to perfection the car was brought out, washed, air dried and panel wiped to prepare the surface for Crystal Serum Ultra. The wheels were removed from the car as it aided in lowering the car more on the lift for ease of coating all areas and the wheels were also getting coated. Crystal Serum Ultra was applied to al painted areas of the vehicle and allowed to cure for two to three hours before overcoating with EXO. While CSU was curing the wheels were decontaminated, air dried to ensure complete removal of water and the wheels were then panel wiped and ready for coating. The entirety of the wheel, the face and inner dish were fully coated with C5 Wheel Armour. Once the wheels were done the first coat of EXO was applied over CSU and this was also allowed another 2 hours to cure before the second coat of EXO was applied completing the CSU Black package and giving the car the ultimate 9 year coating for the ultimate ceramic protection. The Skoda Kodiaq was now ready for delivery to the customer and ensures extremely easy maintenance to keep the paint looking its best.